Size : 14.0 x 18.9 inches. / 35.5 x 47.9 cm. 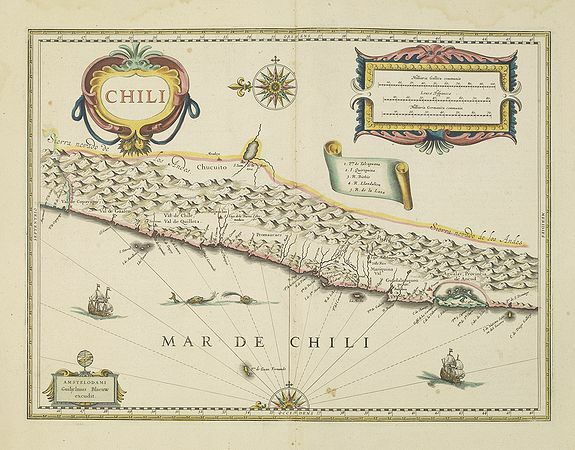 Description :Willem Blaeu's very decorative map of Chili with two large and beautiful cartouches, a compass and ships. The modern cities of Santiago (identified on the map as "S Iago della Nueva Estremadura", Valparaiso (as a river estuary of "ValParayso"), Concepcion, and Valdivia (as Baldiva) are all shown on the map. Condition : Light marginal water staining, not affecting the engraved area. Two little brown spots in lower part of the map. Very good condition. Printed on heavy paper. Very good and dark impression. French text on verso.